Charleston WV – Hip, Historic … almost Heaven! “Charleston is quite a pretty place,” observed a Gallipolis Dispatch journalist in 1861. “It is located on the beautiful bottom on the northeast bank of the river and is entirely surrounded by lofty hills.” The description is as true today as it was in 1861. Their city slogan is “Hip, Historic, Almost Heaven…Charleston, West Virginia” because the city is steeped in historic architecture, an eclectic music scene, bountiful shopping, unique dining and four seasons of changing mountain landscape. Charleston is the capital and largest city in the great state of West Virginia, with a population of 50,821 in the city, but the metropolitan area has 224,743. History: The first permanent settlement, Ft. Lee, was built in 1788. In 1791, Daniel Boone was a member of the Kanawha County Assembly. After the American Revolutionary War, pioneers began making their way out from the early settlements in to western part of Viriginia. A permanent settlement in Fort Lee was built in 1787 by Colonel Savannah Clendenin, which is now the intersection of Brooks Street and Kanawha Boulevard. The town was named after Col. Clendenin’s father, Charles and later shortened to Charleston to avoid confusion of another town named after George Washington’s brother Charles. The town is part of Kanawha county, which is translated “water way or Canoe Way” in Iroquois. Daniel Boone who was a lieutenant colonel in the Kanawha County militia, was elected to serve in 1791 at the Virginia House of Delegates. The legend says he walked all the way to Richmond. During the Civil War, the Union and Confederate armies met in the Battle of Charleston with an initial win by the Confederates and then the Union troops won the city six week later. The Northern hold on Charleston conflicted with the state as it had already seceded from the Union. To resolve this, Abraham Lincoln declared West Virgina the 35th state in June 1863. Economy: Charleston is a center of government, industry and commerce with its early industrial influences included salt and the first natural gas well. Later, coal became central to economic prosperity in the city and the surrounding area. Today, trade, utilities, government, medicine, and education play central roles in the city’s economy. 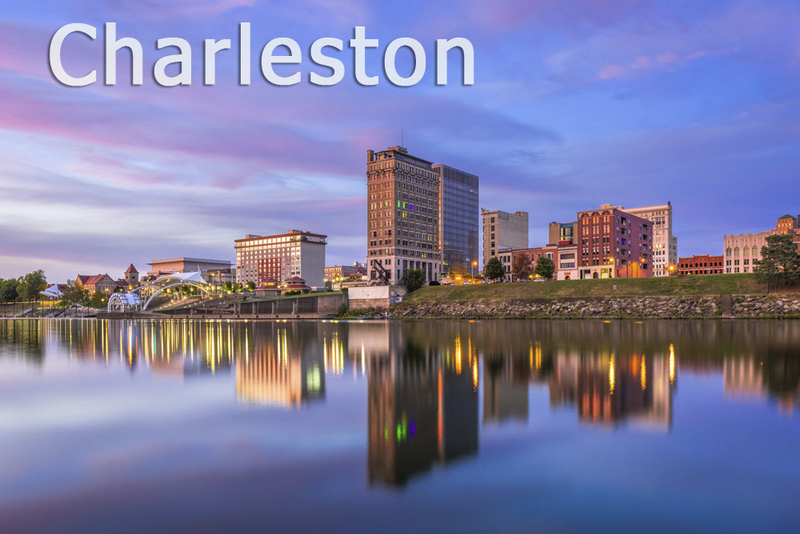 Charleston is the home to the Yeager Airport, University of Charleston, West Virginia University, WVU Institute of Technology, Marshall University, and West Virginia State University, which all are major employers in the area. Charleston is also home to McLaughlin Air National Guard Base of the West Virginia Air National Guard, Appalachian Power, Mountaineer Gas Company, City National Bank, Charleston Newspapers, GESTAMP, MATRIC, Tudor’s Biscuit World, United Bank of WV, Walker Machinery, and WV American Water Company. During World War II, the first and largest styrene-butadiene plant in the U.S. opened in nearby Institute, providing a replacement for rubber to the war effort. Built in 1947, the construction of the Yeager Airport encompassed clearing 360 acres on three mountaintops moving more than nine million cubic yards of earth. In 1956, President Dwight D. Eisenhower signed the Federal Aid Highway Act. Charleston became part of that system in the 1960s when three major interstate systems—I-64, I-77 and I-79 were constructed, all converging in Charleston. In 1983, downtown revitalization began in earnest with the opening of the Charleston Town Center, street scapes and the launching of the WV Public Radio live performance. The Charleston Area Alliance works with local public officials and the private sector to build the economy of the region and revitalize its downtown. Charleston also has an economic and community development organization focused on the East End and West Side urban neighborhood business districts, Charleston Main Streets. Culture: The capital city of Charleston serves as the gateway to all that is wild and wonderful in the Mountain State, including snow skiing, world-class zip-line canopy tours, whitewater rafting, ATV trails, golfing, hiking, fishing, rock climbing, mountain biking, canoeing and kayaking – all within an hour’s drive or less. Charleston is home to numerous annual events and fairs including the WV Dance Festival, WV Symphony Orchestra, FestivALL, West Virginia Day, Gazette-Mail Kanawha County Majorette and Band Festival, WV International Film Festival, NPR Mountain Stage, Charleston Sternwheel Regatta, and the Labor Day Weekend festival. The city is also rich in history considering its past, and has about 50 places in Charleston that are included in the National Register of Historic Places; some of these include: East End, Security Building, 405 Capitol Street, the Union Building, the Kanawha County Courthouse, the Public Library and the Masonic Temple, as well as historic churches. For those who enjoy outdoor adventures, Charleston’s has an abundance of hiking and biking trails, kayaking on the nearby Coal and Elk Rivers, swimming or golfing at Coonskin or Cato parks. The 9,300 acre Kanawha State Forest offers year-round opportunities to get back to nature. Upscale Furniture offers short and long term quality furniture rental in Charleston WV. We offer our services to corporate housing, traveling executives, short-term renters, students, military and temporary staff. We have the ability to work in concert with any apartment community, property management company, corporate housing firm or insurance relocation company to deliver a variety of options from a single sofa rental to a complete “turn-key” corporate furniture package. We also offer our rental services for those needing rental furniture, housewares, bedding, electronics and appliances for home staging, student or military housing, or office furniture for company rentals. For our customers’ convenience, we offer several packages for Standard or Upgraded easy-to-order competitive packages for each room in your rental housing. It is our firm belief that your corporate housing company will tremendously benefit both in quality and affordable pricing should you choose our company to supply your furniture rental needs. We merely ask for the opportunity to earn your business! !